What happens when you don’t like the “it” book? For years, people have raved about Winter’s Tale by Mark Helprin—it’s one of those cult books. I just read it for the 2014 TBR Pile Challenge, and I’m stumped as to my response. Likewise, Charles Frazier’s Cold Mountain languished on my shelf nearly five years because a few friends had panned it. That book wowed me and I think is one of the best American novels written—ever. Recently, I was the only member of book group to adore Julie Otsuka’s lovely novella The Buddha in the Attic, which I had almost skipped owing to email grumblings. Clearly I am not a good indicator of popular culture, because I didn’t love Gone Girl or Sharp Objects by Gillian Flynn. I am dazzled by her writing ability, but I didn’t really care about the characters or the plot. I’m not sure why, because Graham Greene has repeatedly invested me in unlikeable characters and twisted plots—as did Aravind Adiga with The White Tiger, which I could not put down. The Help, by Kathryn Stockett, was very readable, but I felt that it simplified some issues. Even books by a favorite author are not a safe bet. I love the No. 1 Ladies’ Detective Agency series but have not been able to make a similar connection with other books by Alexander McCall Smith. However, these books are beloved by many readers. Thus, I don’t want to subject anyone to my own literary fickleness. They say you can’t judge a book by its cover, but I’d argue that you can’t judge it secondhand either. Back to Winter’s Tale: it moved slowly and felt rather inaccessible. When, in a moment of melodrama, the hero and heroine first kiss … I laughed. I am actually an inveterate shipper, so this was a red flag for me. I did love the horse, though. Still, I don’t want to discourage readers (or offend the legion of Winter’s Tale fans). Plus, I’d hate for someone who might “get it” to miss out because of me. We are now two months into the 2014 TBR Pile Challenge, and I am happy to report that I’ve read two books. The first book I chose was Winter’s Tale, by Mark Helprin, and I have just finished What is Art? by Leo Tolstoy. One bonus of winter is more reading time, especially this year. We’ve already had more than twice the average snowfall—around 55 inches so far and it’s snowing now. All these storms have managed to cancel trips and evenings out, so I have had many more nights reading by the fire (about which I am not complaining). Off to the bookshelf now to pluck another from the TBR Challenge pile. 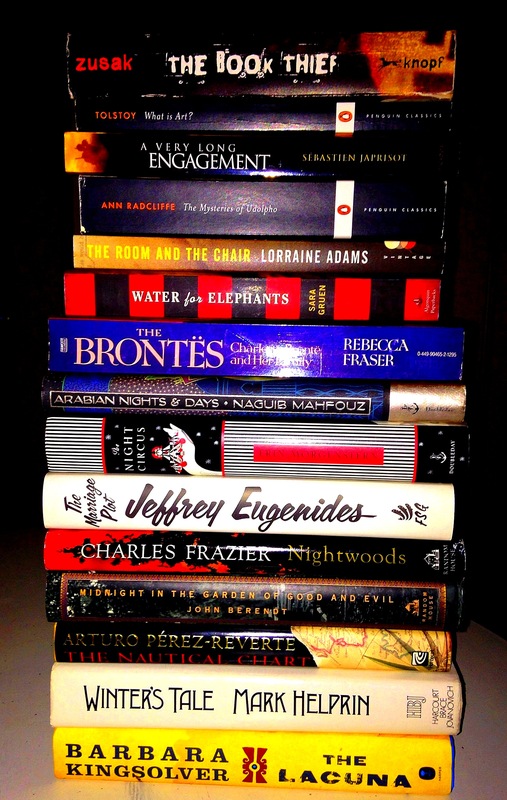 The 2014 TBR Pile Challenge. My article on the Super Bowl for MoreIntelligentLife.com. This Sunday a 37-year-old makes his comeback in the Super Bowl. Peyton Manning, the Denver Broncos quarterback, rose to fame during 13 seasons with the Indianapolis Colts.